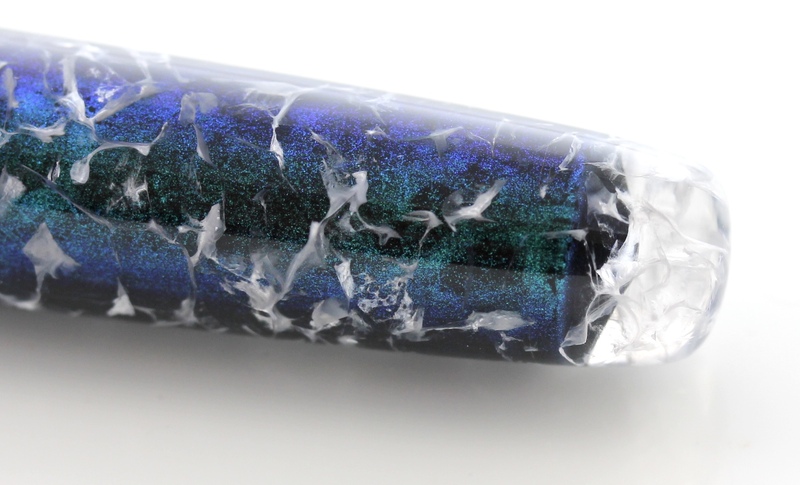 "Closed End Platinum El Presidente Fountain Pen"
Gerry was one of the original contacts made in 2014 when the IAP Collection was initiated. He is a member of the Pen Maker's Guild and was very active in the earlier days of IAP. 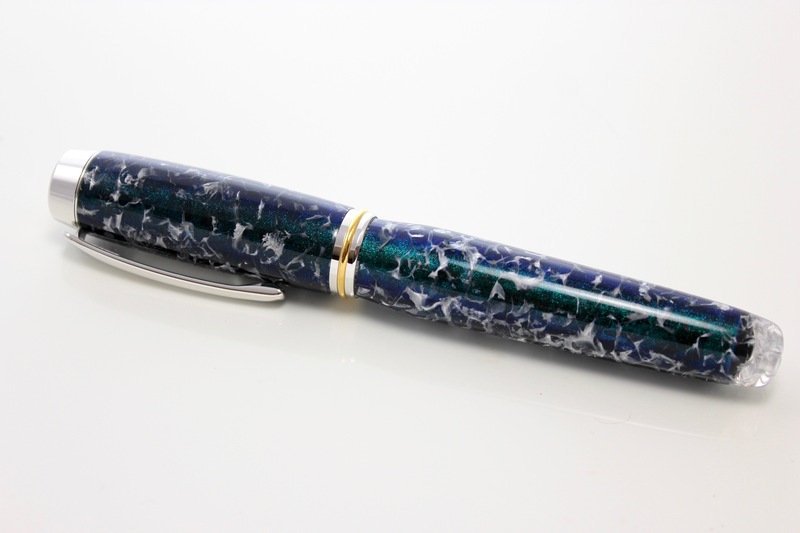 Gerry recently checked his PM's, and graciously added this beautiful pen to the Collection. Thank you Gerry! Nice work - an excellent pen for the collection! That pen is truly a beauty !!!! Can you tell us a bit more about it, Mark, please ? It looks to be turned in a clear resin of a type which I have not seen before (with small "fracture" areas ... for lack of a better word !). And then the interior is decorated with foil or glitter. Last edited by magpens; 05-09-2017 at 06:05 PM. Materials: Acrylic called Crystal Ice from a now defunct company, plus paint. Process: After drilling the holes I wrapped sandpaper around a steel rod and polished the drilled holes. I painted the inside of the acrylic with some color-shifting paint I found in the hobby store where I buy my CA glue and epoxy. I think I gave three coats of paint so bubbles in the epoxy wouldn't be visible. Comments: It took me three tries to perfect the technique so the bubbles in the epoxy were not visible. These pens were very popular with customers. NOTE (from Mark): The color shift is very apparent. It looks almost as if there are two colors of sections, but as you turn the pen, the green turns blue, then green, etc. And the depth of the white "filiments" are very striking. The closest I will reference would be the "Prickly Pear Cactus Blanks" that Curtis makes. The depth is beautiful. Absolutely Beautiful! A great addition to the IAP Collection. Thank you Gerry! And Thanks Mark for gathering all of the works of art in one place so we can admire it!